Although to many the only notable aspect of the upcoming fast of Asarah B’Teves (the 10th of Teves) is that it is by far the shortest fast day in the Jewish calendar for anyone in the Northern Hemisphere (my heartfelt sympathies to the South Americans, So’Africans, Aussies, and Kiwis), nonetheless, the Fast of Asarah B’Teves is quite unique. For example, exclusive to this fast is that it is the only one that we do actually observe as a fast on a Friday. Even Tisha B’Av, which commemorates the actual destructions of our Batei HaMikdash, gets pushed off. Yet, obviously, to maintain this distinction of being the only Fast Day that we actually do observe on Friday, there must be much more to the Fast of Asarah B’Teves than meets the eye. In turns out that Asarah B’Teves has several exceptional characteristics that are not found in any other fast day. 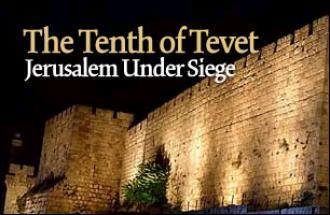 The reason given for fasting on Asarah B’Teves is that it is the day that the wicked Babylonian king Nevuchadnetzar started his siege of Yerushalayim, foreshadowing the beginning of the end of the first Beis Hamikdash, which culminated with its destruction on Tisha B’Av several years later. Therefore, Chazal declared it a public fast, one of four public fast days that memorialize different aspects of the catastrophes and national tragedies associated with the destruction of both Batei HaMikdash. According to the special Selichos prayers said on the fast, a unique aspect of Asarah B’Teves is that we are actually fasting for two other days of tragedy as well; the 8th and 9th of Teves. In fact, both the Tur and Shulchan Aruch assert that if possible one should try to fast on all three days. Nevertheless, of the three, only Asarah B’Teves was actually mandated as a public fast day. On the 8th of Teves, King Ptolemy II (285 - 246 B.C.E.) forced 72 sages separately to translate the Torah into Greek (the Septuagint). Although miracles guided their work and all of the sages made the same slight but necessary amendments, nevertheless this work is described as “darkness descending on the world for three days”, as it was now possible for the uneducated to possess a superficial, and frequently flawed understanding of the Torah, as well as providing the masses with a mistaken interpretation of true morality. Although several decisors write that the reason for fasting on the 9th of Teves is unknown, nonetheless many sources, including the Kol Bo and the Selichos recited on Asarah B’Teves, as well as many later authorities, explain that this is the day on which Ezra HaSofer (as well as possibly his partner Nechemiah) died. Ezra, the Gadol HaDor at the beginning of the time of the Second Beis HaMikdash, had a tremendous impact upon the nascent returning Jewish community of Eretz Yisrael. He drastically improved the spiritual state of the Jewish people and established many halachic takanos, many of which still apply today. With his passing, the community started sliding from the great spiritual heights Ezra had led them. Additionally, since Ezra was the last of the prophets, his passing signified the end of prophecy. Other sources attribute fasting on this day to the passings of other specific Tzaddikim on this day, including Shimon HaKalphus and Rav Yosef HaNaggid, or to the birth of ‘Oso HaIsh’, the founder of Christianity, in whose name myriads of Jews over the millennia were r”l murdered (see extensive footnote 8). The Sefer HaToda’ah posits that it’s possible that “the darkness descended on the world for three days” alludes to the triple woes of these three days: the 8th, 9th, and 10th of Teves. Another exclusive characteristic of Asarah B’Teves is that, as mentioned previously, it is the only fast that can fall out on a Friday. This is fairly interesting as there is a whole debate in the Gemara about how to conduct fasts on a Friday, when we also must take kavod Shabbos into account, implying that it is a common occurrence. However, according to our calendar, a Friday fast is only applicable with Asarah B’Teves, and it happens quite infrequently. The last few times Asarah B’Teves fell out on a Friday were in 1996, 2001, 2010, and 2013. It is next expected to occur in 2020 (5781). After that, 2023 (5784), 2025 (5785), 2034 (5795), and 2037 (5798). The halachos of a Friday fast generally parallel those of a regular fast day. In fact, even though there is some debate in the Rishonim as to the Gemara’s intent that ‘Halacha - Mesaneh U’Mashlim - a Friday fast should be completed’ whether or not one may be mekabel Shabbos early and thereby end the fast before nightfall, nonetheless, the halacha follows the Shulchan Aruch and Rema that since Asarah B’Teves is a public fast (Taanis Tzibbur) and not a Taanis Yachid, one must fast the whole day and complete it at nightfall (Tzeis HaKochavim) before making Kiddush. There are those who maintain it is preferable to daven Maariv earlier than usual on such a Friday night, to enable making Kiddush, and breaking the fast, exactly at Tzeis HaKochavim. The third and possibly most important attribute of Asarah B’Teves is that according to the AbuDraham, if Asarah B’Teves would potentially fall out on Shabbos, we would all actually be required to fast on Shabbos! (Notwithstanding that with our calendar this is an impossibility.) He cites proof to this from the words of Yechezkel referring to Asarah B’Teves (Ch. 24, verse 2) that the siege transpired “B’Etzem HaYom HaZeh”, implying that the fast must always be observed on that exact day, no matter the conflicting occurrence. This would also explain why it is observed on Friday, as opposed to any other fast. Yet, the AbuDraham’s statement is astounding, as the only fast that halachically takes precedence over Shabbos is Yom Kippur, the only Biblically mandated fast. How can one of the Rabbinic minor fasts push off the Biblical Shabbos? Additionally, Asarah B’Teves commemorates merely the start of the siege, and not any actual destruction. How can it be considered a more important fast than Tisha B’Av, which commemorates the destruction and loss of both of our Batei HaMikdash? In fact, the Beis Yosef questions this declaration of the AbuDraham, stating that he “does not know how the AbuDraham could know” such a ruling. As an aside, this does not seem to be the actual halacha, as other Rishonim, including Rashi and the Rambam, both explicitly state that if Asarah B’Teves falls out on Shabbos it gets pushed off. Several authorities, including Rav Yonason Eibeschutz and the Bnei Yissaschar, understand the AbuDraham’s enigmatic statement as similar to the famous Gemara in Taanis (29a) regarding Tisha B’Av. It seems that historically the Beis HaMikdash only started to burn toward the end of the 9th of Av (Tisha B’Av) and actually burned down on the 10th. Yet, Chazal established the fast on the 9th, since Aschalta D’Paranusah Adifa, meaning that the beginning of a tragedy is considered the worst part. Likewise, they maintain that since the siege on Asarah B’Teves was the commencement of the long chain of tragedies that ended with the Beis HaMikdash in ruins and the Jewish people in exile, its true status belies the common perception of it as a minor fast, and potentially has the ability to push off Shabbos. Indeed, the MidrashTanchumateaches that it was already fitting for the BaisHaMikdash to actually be destroyed on AsaraB’Teves, but Hashem, in His incredible mercy, pushed the destruction off to the summertime, so that we would not have to be exiled in the cold. Hence, AsarahB’Teves’s role as the ‘beginning of the end’ underlies the severity of this fast day. The famed Chasam Sofer takes this a step further. He wrote that the reason Chazal established a fast for the siege on Asarah B’Teves, as opposed to every other time Yerushalayim was under siege over the millennia, is that on that day in the Heavenly Courtroom it was decided that the Bais HaMikdash was to be destroyed a few years hence. There is a well known Talmudic dictum that any generation in which the Beis HaMikdash has not been rebuilt is as if it has been destroyed again. Therefore, he explains, every Asarah B’Teves the Heavenly Court convenes and decrees a new Churban. He adds though that, conversely, a proper fast on Asarah B’Teves has the potential to avert future Churbanos. We are not fasting exclusively due to past calamities, but rather, similar to a Taanis Chalom, a fast for a dream, to help prevent a tragedy from occurring. [He even refers to such a fast as an oneg, a delight.] That is why the fast of Asarah B’Teves, even though it is considered a minor fast, nonetheless has the potential to possibly override Shabbos. These explanations would also certainly elucidate why we would fast on a Friday for Asarah B’Teves. The Rambam famously exhorts us to remember the real meaning underlying a fast day. It’s not just a day when we miss our morning coffee! The purpose of fasting is to focus on the spiritual side of the day and use it as a catalyst for inspiration towards Teshuva. In this merit may the words of the Navi Zechariah, “The Fast of the Fourth (month, 17th of Tamuz), the Fast of the Fifth (month, Tisha B’Av), the Fast of the Seventh (month, Tzom Gedalyah), and the Fast of the Tenth (month, Asarah B’Teves) shall be (changed over) for celebration and joy for the household of Yehuda” be fulfilled speedily and in our days. This article was written L'iluy Nishmas the Ohr Somayach Rosh HaYeshiva - Rav Chonoh Menachem Mendel ben R' Yechezkel Shraga, the Kedoshei Har Nof and R’ Chaim Baruch Yehuda ben Dovid Tzvi, L’Refuah Sheleimah for R’ Shlomo Yoel ben Chaya Leah, Henna Rasha bas Yitta Ratza and Rochel Miriam bas Dreiza Liba, and l’zechus Shira Yaffa bas Rochel Miriam v’chol yotzei chalatzeha for a yeshua sheleimah teikif u’miyad! See AbuDraham (Hilchos Taanis), Magen Avraham (Orach Chaim 550, 4), Ba’er Heitiv (ad loc. 4), Aruch Hashulchan (ad loc. end 2), and Mishna Ber ura (ad loc. 10). Melachim II (Ch. 25, verse 1), Yirmiyahu (Ch. 52, verse 4), Yechezkel (Ch. 24, verses 1 & 2). See Zecharia (Ch. 8, verse 19), Gemara Rosh Hashana 18b, Rambam (Hilchos Taaniyos Ch. 5, 1- 5) and Tur & Shulchan Aruch (O.C. 549 & 550). See the Selicha for Asarah B’Teves that starts with the word Ezkerah. Tur and Shulchan Aruch (Orach Chaim 580). Tur and Shulchan Aruch (Orach Chaim 549 & 550). As told at length in Gemara Megillah 9a. For a slightly different version see Maseches Sofrim (Ch. 1, 7 - 8). This quote is found in Megillas Taanis (Ch. 13); and cited by the Tur and Shulchan Aruch (Orach Chaim 580). See Sefer HaToda’ah (vol. 1, Ch. 8, Chodesh Teves, par. Yom Kasheh) at length. As found throughout Shas - see for example Bava Kama (82a) and Kesuvos (3a). Sefer HaToda’ah (vol. 1, Ch. 8, Chodesh Teves, end par. Yom Kasheh). However, even those who advise not to bathe on a regular fast day, nevertheless allow one to do so on a Friday fast L’Kavod Shabbos, with hot water as usual [see Bach (Orach Chaim 550, 3; although cited by both the Ba’er Heitiv and Mishnah Berurah as the source for this rule, nevertheless, this author has been unable to locate where exactly the Bach states an explicit Erev Shabbos exception for bathing), Elya Rabba (ad loc. 2), Ba’er Heitiv (ad loc. 3), Shu”t Ksav Sofer (Orach Chaim 100), Shulchan HaTahor (249, 4), Mishnah Berurah (ad loc. end 6), and Shu”t Siach Yitzchak (247)]. Although the Gemara (Eruvin 41a; also in Midrash Tanchuma, Bereishis 2) concludes ‘Halacha - Mesaneh U’Mashlim’, even so there are many Rishonim (most notably Tosafos ad loc. 41b s.v. v’hilchasa) who understand that to mean that one may conclude his Erev Shabbos fast at Tzeis HaKochavim, even though it means he will enter Shabbos famished (a situation that is normally disfavored), and not that one must conclude his fast on Friday night at Tzeis HaKochavim. A further complication is that this also may depend on whether one is fasting for personal reasons (Taanis Yachid) or an obligatory public fast (Taanis Tzibbur). The Rema (Orach Chaim 249, 4) concludes that for a Taanis Yachid one may rely upon the lenient opinions and end his fast after he accepted Shabbos, prior to Tzeis HaKochavim (especially if he made such a stipulation before commencing his fast), yet for a Taanis Tzibbur, he rules that we follow the Rishonim who mandate strict interpretation of the Gemara, and we must fast until actual nightfall on Friday night. It is debatable whether the Shulchan Aruch is actually fully agreeing with this approach or not. See explanation of the Mishnah Berurah (ad loc. 21 and Biur Halacha s.v. v’im) at length. This has since become normative halacha. See next footnote. See Shulchan Aruch and Rema (Orach Chaim 249, 4), based on the Rosh (Taanis Ch. 2, 4) and Maharil (Shu”t 33); Magen Avraham (ad loc. 8), Bach (ad loc. end 6), Ba’er Heitiv (ad loc. 7), Elya Rabba (ad loc. 10), Korban Nesanel (Taanis, end Ch. 2, 60), Shulchan Aruch HaRav (ad loc. 12), Kitzur Shulchan Aruch (121, 6), Ben Ish Chai (Year 2, Parshas Lech Lecha 23), Aruch Hashulchan (ad loc. 10), Mishna Berura (ad loc. 21 and Biur Hal acha s.v. v’im), Kaf Hachaim (ad loc. 29 & 31), Shu”t Yabea Omer (vol. 6, Orach Chaim 31), Shu”t Yechaveh Daas (vol. 1, 80), Netei Gavriel (Hilchos Chanuka, Shu”t 14), Yalkut Yosef (Kitzur Shulchan Aruch, Orach Chaim. 249, 7 & 559, 25), and Rav Mordechai Eliyahu’s Darchei Halacha glosses to the Kitzur Shulchan Aruch (121, 5). The Netei Gavriel adds that B’shaas Hadchak and l’tzorech gadol one may be mekabel Shabbos early and rely on the lenient opinions, as long it is after nightfall according to several opinions (meaning, a much earlier zeman of Tzeis HaKochavim than the faster would usually observe). See Shulchan HaTahor (Orach Chaim 249, 13) who writes that usually it is assur to complete a Friday fast until Tzeis HaKochavim, even an obligatory fast, as it is an affront to Kedushas Shabbos; rather, he maintains that one should be mekabel Shabbos early and have his seudah before nightfall. Yet, in his explanations (Zer Zahav ad loc. 4) he maintains that regarding Asarah B’Teves on Friday, since we are beholden to follow the ruling of the Rema, one should still be mekabel Shabbos early, and daven earlier than usual, to enable us to end the fast with making Kiddush at the exact zeman of Tzeis HaKochavim. AbuDraham (Hilchos Taanis), cited with some skepticism by the Beis Yosef (Orach Chaim end 550). Rashi (Megillah 5a s.v aval) and the Rambam (Hilchos Taaniyos Ch. 5, 5) both explicitly state that if Asarah B’Teves falls out on Shabbos then it gets pushed off. Similarly, the Ibn Ezra, in his famous Shabbos Zemer ‘Ki Eshmera Shabbos’ explicitly states that Yom Kippur is the only fast that can override Shabbos. This is how the Shulchan Aruch (Orach Chaim 550, 3), as well as later poskim [see, for example, Shu”t Shoel U’Meishiv (Mahadura Kama vol. 3, 179), Shu”t Maharam Brisk (vol. 3, 99), and Aruch Hashulchan, Orach Chaim 549, end 2], rule as well. However, there are many who do defend the AbuDraham’s statement based on the verse “B’Etzem HaYom HaZeh”. [In fact, there is even a minority opinion (see Toras Chaim - 550, 4) who is choshesh for the Abudraham and therefore holds that one should not treat Asarah B’Teves as a minor fast, but rather with similar restrictions as the major fasts.] The Minchas Chinuch (Parshas Emor, Mitzva 301, 7), explaining why nowadays we do not observe fast days for two days (as opposed to other Yomim Tovim, due to the safek yom), writes that the Neviim established fast days in specific months, but did not set the actual day it must be observed, hence the ambiguity in the Gemara which days to observe them. Since they were never established as being mandated on one specific day, they are unaffected by the safek yom, and nowadays only one day must be observed. A similar assessment regarding the establishment of fast days was actually expressed by several Rishonim, including the Ritva (Rosh Hashana 18b s.v. v’ha) and Tashbatz (Shu”t vol. 2, 271). Rav Chaim Soloveitchik of Brisk (Chiddushei HaGra”ch V’HaGri”z al Shas, ‘Stencils’, pg. 27, 44) takes this a step further to explain the AbuDraham’s statement (although quite curiously, he inexplicably credits the BeHa”G with this statement, who in fact makes no mention of this; and does not mention the AbuDraham). He asserts that Asarah B’Teves is the exception to this rule of the Neviim’s ambiguity of exact day, since it is stated about it that it must be observed “B’Etzem HaYom HaZeh”, and therefore would be fasted upon even if it fell on Shabbos. Similarly, the Ohr Somayach (Hilchos Taaniyos Ch. 5, 6 s.v. v’hinei, in the brackets) defends the AbuDraham’s statement, based on a diyuk in the Gemara’s (Eruvin ibid.) choice of question about a Taanis Yachid on Friday, with no mention of a Taanis Tzibur. He posits that the reason the Gemara did not cite such a case is that Asarah B’Teves is the only Taanis Tzibur that can fall out on Friday, and if it can override Shabbos due to “B’Etzem HaYom HaZeh”, then certainly one would be required to fast the whole Friday for it! For more on this fascinating topic see Minchas Asher (Moadim vol. 2, Tzomos, 43). According to our calendar Asarah B’Teves cannot fall out on Shabbos. The AbuDraham (Hilchos Taanis) himself mentions this, as does the Magen Avraham (Orach Chaim 550, 4 & 5), Ba’er Heitiv (ad loc. 3), Aruch Hashulchan (ad loc. 2), and Mishnah Berurah (ad loc. 8). Everyone can easily make this calculation themselves. See Shul chan Aruch (Orach Chaim 128, 2) regarding which days various Roshei Chodesh can fall out on. For the month of Teves, Rosh Chodesh cannot fall out on a Thursday. That means Asarah B’Teves, ten days later, cannot fall out on Shabbos! Ya’aros Dvash (Vol. 1, Drush 2 for 9 Teves, 32 - 33; see also vol. 2, 191 - 193 s.v. v’hinei yadua), Bnei Yisaschar (Maamrei Chodesh Kislev / Teves 14, 1), and Shu”t Shoel U’Meishiv (Mahadura Kama vol. 3, 179); see also Shu”t Maharam Brisk (vol. 3, 99). The Chasam Sofer (Toras Moshe, Parshas Vayigash pg. 40b s.v. vad”z) also cites this reason and explains that it is only at the end of a tragedy when salvation has a chance to sprout. We see this from the famous Gemara at the end of Makkos (24a - b) with Rabbi Akiva, who laughed when he saw foxes wandering through the ruins of the Beis HaMikdash. Only when a tragedy is complete can there be a glimmer of hope for the future redemption. See also sefer Siach Yitzchak (pg. 293) and R’ Moshe Chaim Leitner’s sefer Tzom Ha’Asiri at length. Rav Yonason Eibeschutz adds that according to his calculations, Nevuchadnetzar’s actual siege on that first Asarah B’Teves commenced on Shabbos; meaning that that Asarah B’Teves that Yechezkel wrote “B’Etzem HaYom HaZeh” about was actually Shabbos. The Chasam Sofer (Toras Moshe, Parshas Vayechi, Drush for 8 Teves 5599, s.v. ksiv) agrees with this assessment and offers a variation, that the reason Nevuchadnetzar was successful in his conquest of Yerushalayim, as opposed to Sancheirev, was due to lack of Shemiras Shabbos among its inhabitants! Midrash Tanchuma (Tazria 9). However, see Midrash Tanchuma (Bereishis 2 & 3), who actually takes a very strong stance against fasting on Shabbos, as ‘Kavod Shabbos is adif than one thousand fasts’! Toras Moshe (vol. 2, Parshas Vayikra, Drush for 7 Adar, pg. 9b - 10a, s.v. kasuv). Yerushalmi Yoma (Ch. 1, 1, 6a). Rambam (Hilchos Taaniyos Ch. 5, 1); see also Mishnah Berurah (549, 1). Zecharia (Ch. 8, verse 19).